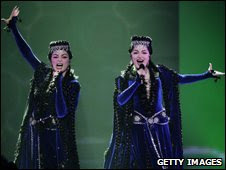 Security forces in Azerbaijan have launched a campaign against the dozens of citizens who committed high treason by voting for the Armenian entry in this year's Eurovision Song Contest. To say that there is no love lost between the two nations is a little like saying Antarctica is a bit nippy. Folowing the 1990s war over Nagorno-Karabakh all borders between the two countries remain closed and tensions remain high. According to the Independent Rovshan Nasirli, a resident of Azerbaijan's capital Baku, was one of 43 people in the country to vote for Armenia's entry "Jan-Jan", sung by the duo Inga and Anush. He told Radio Liberty that he had been summoned to the country's national security ministry last week to explain himself. "They wanted an explanation for why I voted for Armenia. They said it was a matter of national security," said Mr Nasirli, who voted by text message. "They were trying to put psychological pressure on me, saying things like, 'You have no sense of ethnic pride. How come you voted for Armenia?' They made me write out an explanation, and then they let me go." Luckily for Mr Nasirli, he had a cast-iron excuse for voting for Inga and Anush. He didn't like the Azerbaijani entry, which featured an Iranian singer based in Sweden, and voted for Armenia because the song actually sounded "more Azeri"
Hmm now there’s surveillance technology put to good use I don’t think. As for getting irate over who votes for who in the Eurovision, if there is a grain of truth in this story, the Azerbaijan government should find some greater threat to national security like the evil bastards who step on the cracks on pavements. This is an extreme example of what makes me loathe nationalism. What is it with these Armenians? Everyone seems to have a down on them. 'Some greater threat to national security like the evil bastards who step on the cracks on pavements.' - LOL!! I suppose a case of location. location. location James! Glad you like my little joke Julia! It is just cheesy pop Catsynth, I love watching it but some people take it farm,far too seriously! Me too, jams. And you would think the Azerbaijan government would have more important matters to worry about. This has nothing to do with Simon Cowell? It is bloody ridiculous isn't it Welschakes. Good god no Ren, the Azeris are not that evil! It's creepy, scary even. And in a way a nice example. That goes for laws too. They will tell you it is only to deal with big time criminals, terrorists or such. They will suggest that if you are against it you are practically a terrorist, and probably against motherhood and apple pie too. Then they will use it to spy on what rubbish you throw out, or kick a n old man out of a party conference. I found it a very scary example of Big Brother technology allied to an ugly nationalist mindset. the only ism I believe in is Jism! That is so incredibly funny. It sounds like a scenario from a Monty Python sketch, I can't believe it is true. It is hard to believe it's true! Ardern, HGF. It is hard to believe isn't it? I am, like, totally with Azeri security on this issue. Put the phones on vibration, make the traitors swallow the phones with charging cable attached, then start calling them. While slowly cooking them in oil. Playing the Azeri entry at them at full volume till they croak. My God Snoopy you would make MOSSAD, teh CIA, FSB, MI6 and a host of security agencies blench! Bolt of cloth, err lightning! Iran Puts Baha’is on trial for alleged espionage. Some things never change – Ceaucescu’s Romania.